This limited edition holiday-themed Pop-Tart started to appear on grocery store shelves around Halloween 2007. The box features cool blue colors, drifting snowflakes, a smiling gingerbread man and a drawing of an icing bag squeezing frosting into the image of a Pop-Tart. This is a tasty Pop-Tart and fun holiday treat. It's sweeter (16 grams of sugar per pastry) than most other Pop-Tarts and it might be better enjoyed as a snack instead of breakfast. Like Frosty The Snowman's hat, it takes a toaster to really bring these Pop-Tarts to life. The edges that brown faster than the rest of the pastry seem to have more of an authentic gingerbread flavor compared to bites in the center. The sugar that's sprinkled on the outside of the Pop-Tarts gives the gingerbread something to play with in terms of both texture and taste. The filling - described on the box as frosting - is reminiscent of icing you might drizzle over cinnamon rolls. It doesn't have a distinct flavor except for that of sweetness, but the smooth, creamy texture is a nice pairing with the gingerbread crust. Each pastry is etched with a food coloring drawing of a Christmas scene. The box says there are "50 possible images!" Unfortunately, the drawings on the pastries aren't as clear as the examples shown on the box. The sugar and dimples on the top the Pop-Tarts obscure the drawings. The last Pop-Tart I tried either had a picture of a boy skiing or a duck fishing. It was that screwy. The whole painting of the Pop-Tart is overkill on a concept that works without it. Like Bob Cratchit forgave Ebenezer Scrooge, we can forgive Kellogg's for drawing crazy pictures on our food. It's the holiday season and they've given us a fairly good gift in these new Gingerbread Pop-Tarts. What do you think of Gingerbread Pop-Tarts? Where can these be purchased around Birmingham, Alabama? Last year, Walmart SuperCenter in Trussville carried them. This year we can't find them. I live in North Carolina so where can I buy these gingerbread pop tarts? Thanks. Best Pop-tart flavor - we look forward to them every year. 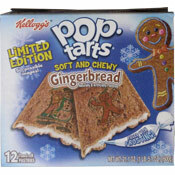 Please tell me where I can find Kellogg s Gingerbread Poptarts, as I haven't been able to find them this year. My 3 yr old LOVES these and I love the smell of the toasting. Makes the place smell soooo good and puts everyone in a good mood! Best pop tarts I ever had... too bad they are seasonal! I'm glad to see them back at Walmart! It didn't say "limited edition" on the box so, hopefully they remain a permanent! Whatever happened to the chocolate caramel pop-tarts though? I loved those!! Oh well, cherry will always be my favorite, but the gingerbread is a very close second along with the hot fudge sundae, yum-O! I just bought some for the first time at Big Lots for $2.00 for a box of 12 Pop Tarts. They're pretty good, would eat them again! I loved this flavor! I agree, this flavor should be permanent! The best! Please bring them back. As you can see it is March and I am looking for them on the shelves still!!!! They should be part of the regular flavors! 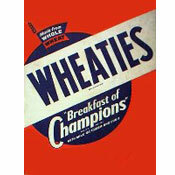 My college daughter loved these but you can't find them in the stores anymore. You need to have them as a regular flavor and available everywhere. They broke my toaster, it fell apart and stuck to the sides and parts of it went into flame, and I'm not kidding either. I sent a complaint to Kellogg's. And no I didn't leave it on too long or have the the temperature too high. I left it on 2 out of 10 for about 15 seconds. They are way too soft! These are the best!! Reminds me of Grandma's Soft Gingerbread Cookies we used to make as kids. Better than any of the regular Pop Tart flavors!! I would buy all year round!! My kids loved these, and I cannot find them for sale anywhere anymore. Ha Ha. They make me happy when I look at them and the gingerbread makes me giggle! =D The best ever! Get them!